Group C: The Group of Equals!!! World Cup Group C: The Group of Equals! 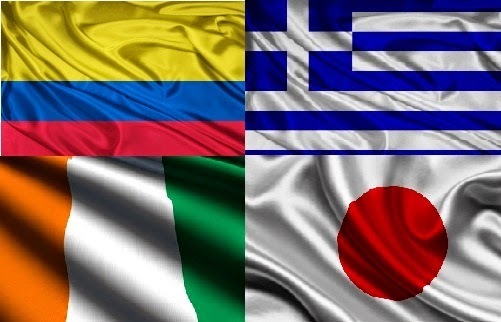 Teams: Colombia, Greece, Ivory Coast and Japan, who will qualify from this group? This is by far the closest group in this year’s FIFA World Cup. With no significant World Cup history between these sides, it would be intriguing to see how these teams from different continents clash against each other. This can well be called the “Group of Equals”! Ranked as the fifth best team in the world (FIFA ranking-5), Jose Pekerman’s side is being considered by many as the favorites in this group. The side has however been dealt a severe blow with star striker Radamel Falcao being ruled out. But with players like Jackson Martinez, James Rodriguez, Carlos Bacca and Freddy Guarin, Pekerman’s side would not have to worry much. Both Rodriguez and Bacca have had a fantastic club season. The former guided AS Monaco to the second spot in the French Ligue while the latter was instrumental in Sevilla’s Europa League win. Inspite of the many stars that this team has, it is Abel Aguilar, the midfielder from Toulouse who guides the side. His hunger and dedication on the pitch along with his vision to create opportunities would be vital to Colombia’s chances this year. Back in 2004, Otto Rehagel’s side shocked the world by defying all odds and winning the Euro Cup. Ten years later, the team neither has Otto Rehagel nor Angelos Charisteas (the star of Euro 2004). The lack of star names is a major cause of concern. Since Euro 2004, the performance of the team in international tournaments has been dismal. Greece’s hopes rest on their seasoned midfielder Giorgos Karagounis and forward Konstantinos Mitroglu who in fact would be willing to make amends after a dismal time at Fulham. It would also be interesting to see the Greek defence which conceded only 4 times in the qualifying campaign. The defence does hold the key for Fernando Santos’ side. With players such as Didier Drogba, Yaya Toure, Gervinho and Wilfried Bony, it would be foolish to ignore this team. Sven Goran Eriksson’s side even has the necessary firepower to top the group and cause some big upsets later on. However the seriousness and commitment of the big players has been a cause a concern for the “Les Elephants”. They have failed to go past the group stage in all their attempts and would be willing to better the record this time around. Should the “Les Elephants” achieve something significant this time, the credit would largely go to the work done by Eriksson. Boasting of stars like Keisuke Honda and Shinji Kagawa, the 2011 Asian Cup winners would be keen to make their mark on the world stage. Italian coach Alberto Zaccheroni’s style of play has added the steel to the Japanese defensive setup. They have had a mixed qualifying round where they beat the likes of Oman and Jordan emphatically but lost out to North Korea and Uzbekistan. Keisuke Honda however holds the key. Being considered as the replacement to Hidetoshi Nakata, Honda will have to replicate his performances of CSKA Moscow and AC Milan to guide Japan through. Kagawa will be keen to impress after a disappointing season at Old Trafford. On the other hand, Shinji Okazaki will be hoping to play an integral role in Japan’s campaign.